Wild Orchid has grown a lot over the years, but our wedding hair and makeup team has always remained small and intimate. We pride ourselves in artists that truly care and provide a genuine service. Each wedding or special occasion is unique to us and we hope you find comfort, calm and confidence in our artist’s hands. Schedule a trial consultation and service appointment to collaborate with the leading bridal stylists at the Wild Orchid Salon for your Bridal Hair Trial. You and your stylist will create two different wedding hairstyles, each customized to match the style of dress and the fashion of your wedding or perhaps a look for the service and another for the reception. The end goal being a bridal look that best represents your personal style and the vision you have for your wedding day. Wild Orchid can accommodate a bride or large wedding party in any of our salons. We have hosted wedding parties up to 12 in the salon for services providing timely services to get you on the way to your venue for pictures and your ceremony. Your stylist will consummate all the time and effort you spent collaborating to discover the perfect wedding look. For a reasonable fee, the Wild Orchid bridal hair team will meet you on location at your wedding venue. Your hairstylist and supporting stylists or assistants will be prepared and fully equipped to transform your hair into the glamorous and sophisticated wedding hair style you have envisioned as well as your entire wedding party. Schedule a consultation and makeup service to collaborate with a professional makeup artist who will demonstrate a bridal makeover, customized to work perfectly with your veil, dress, and overall wedding presentation. 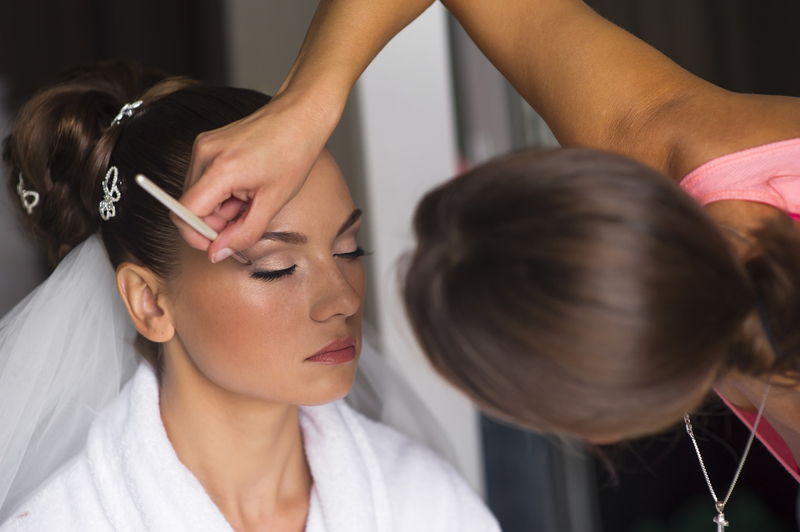 On your wedding day, your Bridal Makeup service takes place at Wild Orchid Salon prior to your hair service. There, your makeup artist will be primed and ready to deliver your wedding makeup style with refined and elegant look. For a reasonable fee, the Wild Orchid bridal hair team will meet you on location at your wedding venue. Your professional makeup artist comes fully prepared and equipped to provide you with a brilliant bridal makeover.